As I walked around my local course this week, picking up beer can after beer can that magically hopped from their trash receptacles and out onto the fairways, a thought occurred to me: Disc golf and craft beer have a lot in common. Disc golf and craft beer have both grown exponentially in the last decade. And this isn’t just conjecture. According to the PDGA, 1,973 courses existed in 2005; at the end of 2014, that number was 4,723. The Brewers Association, a group whose purpose is “to promote and protect American craft brewers, their beers and the community of brewing enthusiasts,” tallied the number of craft breweries open in 2005 at 1,447. By 2014, that number vaulted to 3,464. In both cases, that is growth of 139% over 10 years. While that’s a bit of kismet for both growth numbers to line up so effectively, it truly demonstrates just how meteoric the rise of these industries has been. So it was only natural, then, that I spent the last few weeks throwing putters from a company that labels itself as the best of both worlds, a “craft discery:” Reptilian Disc Golf. The O’Fallon, Missouri company’s origin story reads similar to that of many a small brewer. Rather than a homebrew kit in the garage, though, Reptilian began in 2013 with original art on standby molds like the Gateway Wizard before deciding to create its own discs. After forging a partnership with Gateway, which resides in neighboring St. Louis, Reptilian released the Scale – an overstable putter that shares a bottom mold piece with the Wizard – and the Serpent, which is derived from the Gateway Magic. Where Reptilian has distinguished itself from the Gateway molds, though, is with its top piece of the mold: A large contour – a roughly thumb-width groove, if you will – encircles the flight plate on both discs. The resulting design not only makes for a feel that few putters possess, but also beefs up the stability. Another – more important, in my opinion – byproduct of the Gateway-Reptilian marriage is that the brands have worked together to release some of the most delicious boutique plastic on the market. Reptilian sent me a Serpent in Fossil plastic, a mix the company calls its signature blend. It is extremely rigid, yet still has a velvety smoothness to it when you run your finger across the top of it. 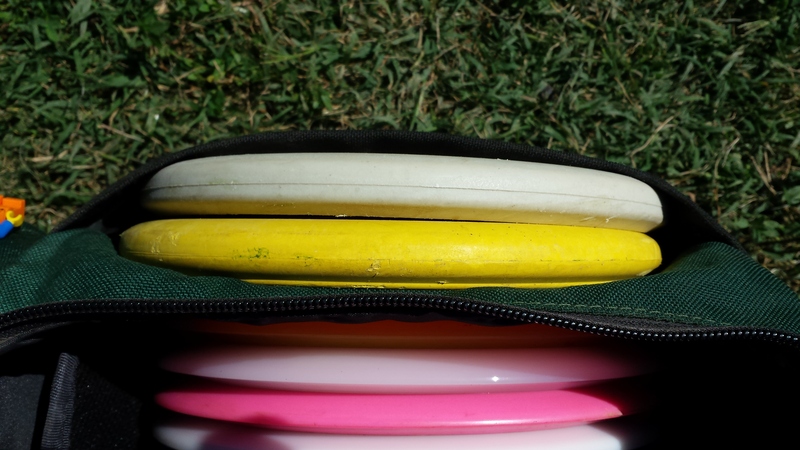 It harkens, Reptilian says, to the “vaunted plastic of disc golf yesteryear” – hard as a rock, yet still grippy. I also received a Scale in Reptilian’s Fossil Fuel blend, which adds color and a bit more flexibility to the original Fossil blend. As a result, Fossil Fuel is a bit more soft and pliable than its predecessor, but still has a firm feel. While the difference between the two comes down to preference more than anything, the Fossil plastic, for me, is like a Mosaic IPA: I can’t get enough. If I could send my usual putters to Reptilian and have them molded up in Fossil, I would do it in a heartbeat. That’s not to say Fossil Fuel is a slouch, by any means. I liken it more to an IPA versus a Pale Ale: One’s a little harder on the palate than the other, but they’re both tasty. It doesn’t matter how a disc feels, though, without also knowing how it flies. And I will admit that, much like the first time I dabbled in hop-heavy beers, I didn’t really click with the Scale and Serpent off the bat. The Reptilian Disc Golf Serpent (white) and Scale (yellow) are both deep putters that make for a nice one-two punch. As someone who is used to shallow putters, the Scale and Serpent are a shock to the system. Both are tall – the Scale is taller than the one Wizard I own, by comparison – and the depth really took me some time to get used to. I am a bit of a knuckle-dragger on putter drives when throwing deep dish molds, and what I mean by that is that the knuckle on my index finger curls too far underneath the rim when I release it, inducing off-axis-torque and ugly wobbles. As a result, I wasn’t seeing much overstability out of the Scale when I first threw it. It would wobble a bit, then go straight without fading much at the end. However, much like living in San Diego has found my palate regularly evolving, a minor grip adjustment had me seeing the desired flights out of both the Scale and the Serpent. And I soon realized that, much like their Gateway cousins, they make for a complementary one-two putter punch. With a clean pull and release, the Serpent lives up to its billing as a “stable” putter. It will retain a straight, almost perfectly high speed stable line before fading gently at the end of its flight. Add a little hyzer or anhyzer, and it holds the line. It makes for easy, straight drives and approaches. The Scale, on the other hand, wants to do one thing: fade. It is a power-hungry mold, one that makes for shorter drives but more reliable upshots. And a trip to the local pitch-and-putt, Montiel Park, truly but both molds into full view. With the Serpent, I overshot the first basket when misjudging just how straight it would go. The Scale, on the other hand, faded out early when I didn’t give it enough gas. I was able to adjust on the second hole, using the ending fade on the Scale to park it for an easy birdie. On the whole, my experience with both of these molds leaves me excited to see what else Reptilian Disc Golf has in store. The company, in a short time, has managed to hone its craft with a unique style that is easy to support. By the time I got to Hole 5 – a short hole at only 200 feet, but with a steady uphill climb – I was starting to understand the nuances of each mold. But I was surprised when, after releasing both on an anhyzer angle and with some height, they landed within a foot of each other. The Scale, it seems, can hold a steeper anhyzer to the ground, but I think the hill played a factor. That same release on flat ground, or downhill, would see the Scale flex out. On Hole 6, I used a baby anhyzer on the Serpent to get it to track a beautiful, closed parentheses-shaped path for a drop-in deuce. On Hole 7, a big downhill shot, the Serpent ran the open parentheses line to cuddle up with the pin. While I enjoyed overall success during this round, there were a couple shots that dampened my enthusiasm. Holes 8 and 9 are both long downhill shots – long by pitch-and-putt standards at 350-plus, at least – that I have reached with lower-profile putters. The Scale and Serpent, compared to these other driving putters, are low on the glide scale, and they dropped to the ground early. This isn’t necessarily a knock on the molds, but rather something to consider. If you prefer a little more speed and glide on your putters, eeking out all the distance you can, you might want to look somewhere else. But if you need molds that are going to sit down reliably – even if they are a bit shorter – look no further. And I must give the Scale and Serpent their due credit: Much like a fine barrel-aged brew, both have become better with time. The Serpent, in particular, has seen an increase in glide as it has worn in, and the Scale has lost a bit of its fade while retaining its high speed stability. On the whole, my experience with both of these molds leaves me excited to see what else Reptilian Disc Golf has in store. The company, in a short time, has managed to hone its craft with a unique style that is easy to support. And with a newly-released small bag, a meathook utility midrange, and two drivers on the horizon, it is making like its small-batch brethren and continually looking for ways to diversify its selection. For a company living in the land of Budweiser, Reptilian is, ironically enough, full of flavor. Drink it up.